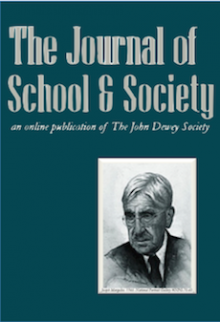 Articles and supplemental files submitted for publication in The Journal of School & Society must be the original and unpublished work of the author(s). Other materials of interest to the readers, including lesson plans and resources, and links to other sites and publications, may also be submitted to the Editors, and will appear on the site subject to their suitability for the publication and interest to the readers. Submissions for the peer-reviewed section of the journal are expected to conform to scholarly standards in their use of theory and empirical research to ground discussion of educational issues. Expected article length is ordinarily in the 5,000-8,000 word range, but both longer and shorter pieces can be considered. In addition, given the flexibility offered by our online format, supporting files (in both data and audiovisual format) may be integrated with the text. In addition to the Editors, articles in this category will be read by a minimum of two peer reviewers. Work should follow the Chicago Manual of Style, 16th Edition, with references footnoted at the bottom of the page. Indicate placement of figures, tables, or supplemental (data or media) files clearly. Email submissions to the Editor, Kyle Greenwalt, at greenwlt@msu.edu. Copyright of all published work remains with the author(s). As an open-access journal, we encourage authors and readers to share our publications freely, with appropriate acknowledgement. As a matter of standard academic practice, any subsequent print appearance of a work published in The Journal of School & Society should acknowledge that prior publication. © 2016-2019 Journal of School & Society. All Rights Reserved.